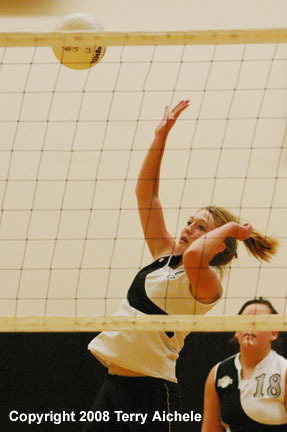 IRRIGON - The Irrigon Knights hosted the Umatilla Vikings in a junior varsity volleyball match Tuesday afternoon. The Irrigon Knights took off wtih a 8-0 in the opening moments of the first game. Umatilla then went on a 8 points to run to close to two, 10-8. The Vikings were able to tie it at 11-11. From that point on Umatilla slowly pulled away from the Knights to take a 19-14 lead. From that point Umatilla pulled away to a 25-15 win. The JV Knights came roaring out of the gate in the second game. They took the lead at 2-1 and it wasn't close for the rest of the game. Irrigon servers took long runs of serve. Irrigon (player #18) closed out the second game serving for nine straight points. The final score had Irrigon winning 25-6. In the first to 15 third game both teams played tough and stayed close tieing it up at 9-9. Umatilla was able to control the ball a little better in the closing moments of the game to take it 15-11. 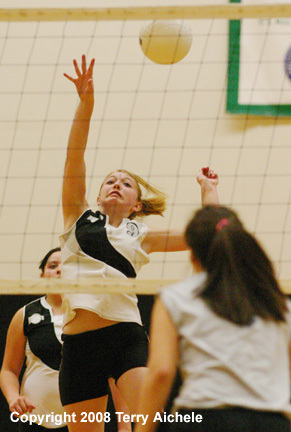 LEFT - An Irrigon JV player bumps the ball during the first game. 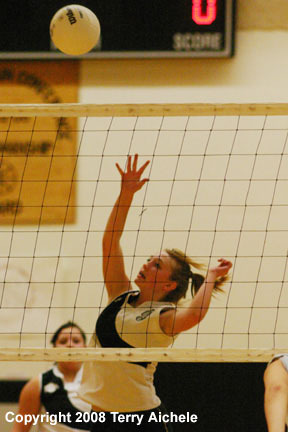 RIGHT - An Irrigon JV player tries for a shot. LEFT and RIGHT - An Irrigon JV player hits a shot. LEFT - Umatilla JV player Brittani Anguiano bumps a serve during Tuesday's game. RIGHT - An Irrigon JV players keeps the ball in play. 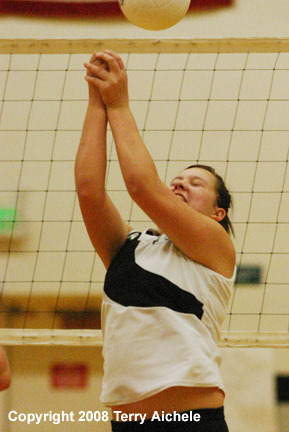 An Irrigon player bumps a serve during Tuesday's game with Umatilla.